living at New Durham, Strafford County, New Hampshire. "New Hampshire, Marriage Records, 1637-1947," index and images, FamilySearch (https://familysearch.org/pal:/MM9.1.1/FL81-GFW : accessed 01 Dec 2012), Zanello D. Berry and Mageon E. Hale and null, 1889. 1900 United States. Census Office. 12th census, 1900 population census schedules, Washington, District of Columbia: Bureau of the Census Micro-Film Laboratory, ([197-]) , Census Place: New Durham, Strafford, New Hampshire; Roll: 951; Page: 8B; Enumeration District: 0232; FHL microfilm: 1240951. 1910 United States. Bureau of the Census. 13th census, 1910 population census schedules, Washington, District of Columbia: Bureau of Census Micro-Film Lab, ([19--?]) , Census Place: New Durham, Strafford, New Hampshire; Roll: T624_866; Page: 4B; Enumeration District: 0291; ; FHL microfilm: 1374879. 1930 United States. Bureau of the Census. 15th census, United States, 1930 federal census : population schedules ; NARA microfilm publication T626, Washington, District of Columbia: Bureau of the Census Micro-Film Laboratory, ([19--?]) , Census Place: New Durham, Strafford, New Hampshire; Roll: 1306; Page: 2B; Enumeration District: 19; Image: 700.0; FHL microfilm: 2341041. Leah Beverly was born perhaps about 1691. 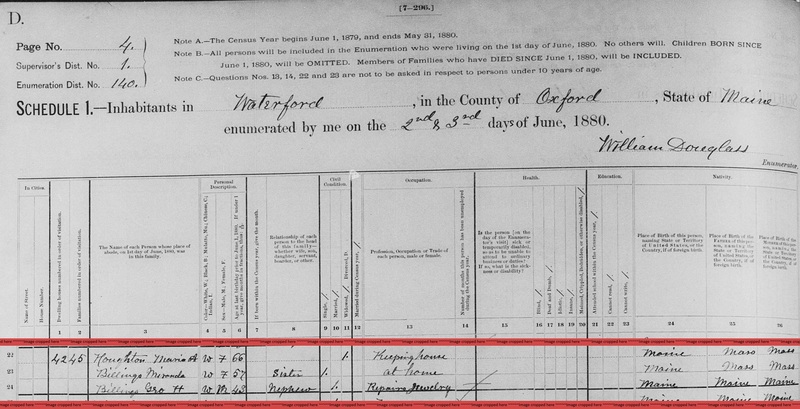 "Maine Births and Christenings, 1739-1900," database, FamilySearch (https://familysearch.org/ark:/61903/1:1:F4SC-YM1 : 4 December 2014), Maria Annette Billings, 13 Apr 1814; citing Waterford, Oxford, Maine; FHL microfilm 12,625. "Maine Marriages, 1771-1907," database, FamilySearch (https://familysearch.org/ark:/61903/1:1:F4X7-JB9 : 4 December 2014), Calvin Houghton and Maria A. Billings, 22 Nov 1835; citing Civil, Waterford, Oxford, Maine, reference ; FHL microfilm 12,625. 1880 United States. Census Office. 10th census, 1880 federal population census, Washington, District of Columbia: National Archives and Records Service, ([19--]) , Census Place: Waterford, Oxford, Maine; Roll: 484; Family History Film: 1254484; Page: 355D; Enumeration District: 140; Image: 0836. "Maine Births and Christenings, 1739-1900," database, FamilySearch (https://familysearch.org/ark:/61903/1:1:F4SZ-HJG : 4 December 2014), Clarissa Augusta Houghton, 29 Oct 1843; citing Waterford, Oxford, Maine; FHL microfilm 12,625. "Maine Births and Christenings, 1739-1900," database, FamilySearch (https://familysearch.org/ark:/61903/1:1:F4SZ-HJR : 4 December 2014), Florence Elsada Houghton, 15 Mar 1846; citing Waterford, Oxford, Maine; FHL microfilm 12,625. Ellery Bicknell Crane, a class="ext" href="http://books.google.com/books?id=ByzhgLUOIRIC" Historic Homes and Institutions and Genealogical and Personal Memoirs of Worcester County, Massachusetts, /aVol. 1, New York: The Lewis Publishing Company, (1907) , p. 538. "Massachusetts Births, 1841-1915", database with images, FamilySearch (https://familysearch.org/ark:/61903/1:1:FXCP-HFM : 1 March 2016), Emma Augusta Bishop, 1857. "Massachusetts Births, 1841-1915", database with images, FamilySearch (https://familysearch.org/ark:/61903/1:1:FXCD-K8Y : 1 March 2016), Frank Ranger Bishop, 1853. "Massachusetts Marriages, 1841-1915," database with images, FamilySearch (https://familysearch.org/ark:/61903/1:1:N4Q7-LWT : 17 February 2016), William W. Hart and Lalia A.M. Bishop, 13 Aug 1898; citing , Wakefield, Massachusetts, United States, State Archives, Boston; FHL microfilm 1,843,708. "Massachusetts Births, 1841-1915", database with images, FamilySearch (https://familysearch.org/ark:/61903/1:1:FXH5-S4X : 1 March 2016), Olive Bishop, 1860. J. H. Temple, History of North Brookfield, Massachusetts: Preceded by an Account of Old Quabaug, Indian and English Occupation, 1647-1676; Brookfield Records, 1686-1783, , at https://books.google.com/books?id=Aj0vGKe_JegC . The Town of North Brookfield, (1887) , p. 717. "New Hampshire, Marriage Records, 1637-1947," index and images, FamilySearch (https://familysearch.org/pal:/MM9.1.1/FL8Y-TZ3 : accessed 01 Dec 2012), C. Arthur Black and Laura A. Leeds and null, 1894. Susan married John Goodrich, son of Ambrose Hale Goodridge and Nancy Moore, on October 26, 1860 in Belmont, Massachusetts, as his second wife, and her second husband. She first married a Mr. Avery. "United States Census, 1880," database with images, FamilySearch (https://familysearch.org/ark:/61903/1:1:MHXX-6N5 : 11 August 2016), William Blair, Boston, Suffolk, Massachusetts, United States; citing enumeration district ED 576, sheet 68C, NARA microfilm publication T9 (Washington D.C.: National Archives and Records Administration, n.d.), roll 0552; FHL microfilm 1,254,552. (?) Blaisdell was born perhaps about 1734. (?) Blaisdell was born perhaps about 1738.